Home / Blog / Introducing Our New Newsletter! You may not have noticed, but an important anniversary slipped by quietly at the beginning of this month. As of September 8, DFA has been around for half a year! Over that time, we’ve gathered together—in groups both large and small—for more fun, creative, friendly fetish activities than our Valley has seen in ages! And we’ve grown from under 200 members to over 500! It’s clear that our concept of a member-driven fetish organization built around the principles of Brotherhood, Gear, Education, Play and Pride has been widely welcomed by our Desert Community. Now that Fall is here, our member-organizers have got a bunch of exciting plans in the pipeline, plus there are new developments at both Palm Springs Pride and Leather Pride too. With growth comes change, and one of those changes will be the way in which we communicate with you. Starting today, we’re introducing our new DFA Email Newsletter. If you’ve been following our web site posts by email, you’ve automatically been subscribed! When we first created DFA, our communications needs were simpler. Whenever there was something to tell everyone, we just posted it on our blog. Everyone who was following the DFA site by email would get the news automatically sent to their inbox. There are some things, however, for which new blog posts just don’t make a lot of sense—things like updates about DFA activities that have already been announced, the amount of space left in limited-capacity programs, reminders about recurring events, and announcements about cool stuff produced by other groups. Those things, plus the stuff that we have always announced on our blog, will make up our new and improved newsletter. Don’t worry! We’ll still only publish the newsletter when there’s something that you need to know. And we promise never to overwhelm you with messages that are too long or off-topic. Until you decide which format you prefer, you’ll get some information twice. If you follow our web site by email, you will continue to receive the messages that the site automatically generates whenever we post something new in the blog. You’ll also get that information in an abbreviated form, plus extra stuff, in the newsletter. Our intention was just to unsubscribe you from our blog posts and re-subscribe you to our new newsletter. Unfortunately, what we didn’t know when we originally set up the DFA website is that only you can unsubscribe from our website posts. This is a limitation imposed by WordPress, the software that runs our blog. It’s WordPress’ way of keeping unscrupulous site operators from messing around with a subscriber’s personal data. 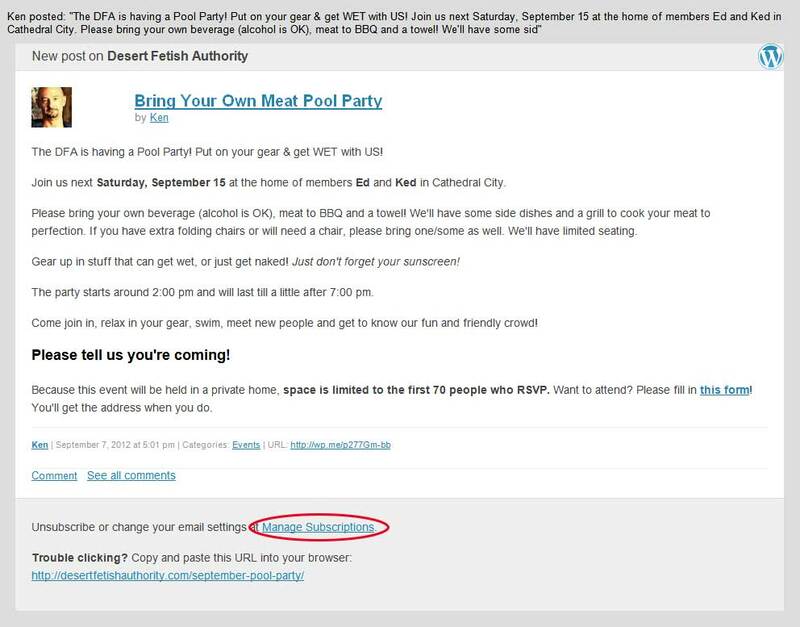 If you’d no longer like to receive them, click the “Manage Subscriptions” link near the bottom of the message (circled in red) and follow the instructions on the web page to “Unfollow” the Desert Fetish Authority blog. Prefer to unsubscribe from the new DFA newsletter instead? Just click the “Unsubscribe” link at the bottom of the newsletter. We think that you’ll prefer the new newsletter because it will be both more attractive, informative and concise. But try out both news sources for awhile and decide which you prefer! You may have noticed that, contrary to this posting, you are not getting some news twice! There’s a technical explanation for this, but the simplest thing to say is that we found a way around that problem. So now you can ignore these instructions. Hooray!